It was another great year for short fiction, and the decision was, as always, a very difficult one to make. In the weeks to come we'll also present a long list of other notable story collections published in 2010, which will be hard to narrow down to a manageable number of books. The Story Prize event will take place at the New School’s Tishman Auditorium in New York City at 7:30 p.m. on Wednesday, March 2. 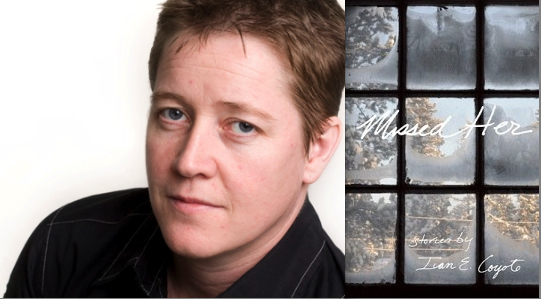 That night, the three finalists will read from and discuss their work on-stage. At the end of the event, Julie Lindsey will announce the winner. Advanced tickets online through SmartTix or through the New School box office, by phone (212-229-5488) or email (boxoffice@newschool.edu). If you want to call for tickets, please note that the box office is closed until Jan. 24. After that, hours are from 4 to 7 p.m. Mon.-Thurs. and 3 to 6 p.m. on Fridays. In the weeks ahead we'll be posting more about the finalists, their books, and the upcoming event. We'd especially like to thank the 71 authors who contributed guest posts to this blog. It was, to my mind, a successful experiment, and a we plan to do it again in 2011. 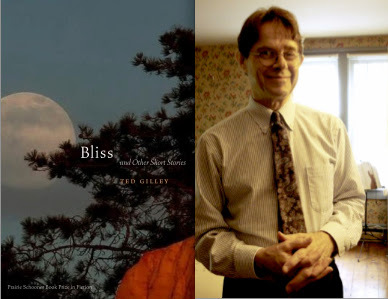 In the 71st in a series of posts on 2010 short story collections entered for The Story Prize, Ted Gilley, author of Bliss (University of Nebraska Press), discusses process, feedback, and influences. Usually for a story to get started, two or more ideas need to collide; I seldom get started with a single idea. Two ideas colliding throws off sparks and leads (I think) to more interesting outcomes and to more stuff happening; gets my brain going, anyway. When I don't define a problem at the outset, I'm in trouble; I need to understand where the pain--or at least in one case, the pleasure—is located before I get going, or I'll just go around in circles. I then bang away until I hit a wall, which usually—not always—happens about halfway through, and then there's trouble. A story of mine can sit completely stalled for a long time, and it's dreadful. But occasionally you get a gift. For example, I once had a story come to me almost complete in a dream. I woke up, wrote down the first sentence of the story, and went back to sleep. In the following week, the story wrote itself. There's usually not that much fun involved, though. At a late stage, and I need to be feeling pretty good about what I've got. My idea, lame though it may seem, is that if you don't know what you've got, you have more than one problem. I look for someone who is more or less disinterested in my story, fiction generally, or even in me. I don't look for another writer, and I definitely don't want a "here's what I would do" response. A smart, disinterested reader is all you need. I'm not interested in writing groups, so that's out. My wife Ivy is a good reader for me, and frequently points out things I hadn't thought to question. Happy New Year, Herbie and Other Stories, by Evan Hunter. This was Hunter's only story collection. He had just hit it big (or was about to) with The Blackboard Jungle, but I didn't know that. It was 1963, and I was thirteen. The strange thing was that I didn't seek the book out; I'd never heard of Evan Hunter. But this paperback with its evocative title was lying in my otherwise empty locker at the beginning of the school year. A bolt out of the blue! I devoured the unapproved, unrecommended, un-high-school stories. The title story has retained its power, though the rest of the collection looks less strong to me now. But at the time, I was bowled over by these somewhat gritty stories. It was as if I could feel Hunter working; in some intuitive way, I knew what he was doing, and I knew I could do it, too. I play electric bass in a (mostly) jazz trio. Writing, of course, is solitary, whereas the music is definitely not just about me but about the other two guys. I have to listen as much as I play; I have to be moved, and at times I have to push. I have to surrender to the music—and I'm sure that sounds trite, but it's accurate. They say in AA that in order to win, you first have to give up. Playing jazz is something like that. Writing is something like that, too: You give up while holding on tight. Richard Ford. No writer I know of writes with all his senses up and running the way Ford does. Reading Independence Day is like living in Frank Bascombe's skin—and it's not always a pleasant experience. Ford spares no one, leaves nothing out, misses nothing, never fails to praise what is praiseworthy, and comes down hard when he must. But my question is, who said Leo Tolstoy was dead? Kind of. I wrote a very brief story (a thousand words) called "All Hallows' Eve" in about two hours and didn't do more than tinker with it afterward. However, the closing line bugged me for months, and finally I changed it. I think I changed one word in it, and then it clicked. So I guess I've flunked this question. The composer Alec Wilder was my mentor. He read my poems back when I first started writing, at about 25, and while he certainly sometimes liked what I was doing, he didn't throw praise around; that wasn't the point. But he encouraged me strongly, and more important, he treated me as an equal—and he was a pro, after all. I knew I was not his equal—far from it! But his words, and the way he lived, put the steel in me. We lived on different coasts but corresponded for several years. Wilder was a very old-fashioned gentleman but his work was up to the minute. He introduced me to some modern poets (on paper) as well as to writers like Cheever, John O'Hara, and Joyce Cary, the superb Irish novelist. In the 70th in a series of posts on 2010 short story collections entered for The Story Prize, Ivan Coyote, author of Missed Her (Arsenal Pulp Press), discusses her cyclical writing process and how exploring archives generates ideas. "Maiden Heart" tells the story of my father's second wife, who was also his first girlfriend when he was a kid. They were separated for thirty years, during which time she was in a physically abusive relationship with a truck driver from northern British Columbia. She called my dad on his fiftieth birthday, and they rekindled their teenage romance. They have been married now for fourteen years. "Maiden Heart" tells the story of their courtship and reunion. In the winter I write at night, late into the evenings. In the summer I write early in the morning. I think this is a by-product of growing up in the Yukon, where there are 22 hours of daylight in June and 22 hours of dark in December. I am very cyclical like that. Woman On The Edge of Time by Marge Piercy was one. There were many, but that was a big one. The invention of an entirely different society was very inspiring for me, even though my work is nothing like hers at all. I am always in the archives. Old photographs, newspapers, books, film archives. I cannot get enough of them. Even if a lot of the information doesn't make it into the work itself, it generates ideas for me. Right now I am researching old maps and building plans for cabins, among other things, for a book I am currently working on. I am currently taking guitar and vocal lessons. I often tell stories with a collaborator playing music. I would like to eventually accompany myself. Sixty years, in the story "All About Herman," my grandmother's love story. It's a classic.